Oh, wait, I’m not your favorite ENFP? That award goes to Carol Burnett? Oh. OK. I’m not even hurt. Sorry I haven’t posted, baby-blog!! I kind of feel like writing ten articles today and back-posting them so it appears I’ve been on-the-ball, even though I haven’t. I read this article yesterday, “25 struggles only ENFPs will understand,” because I am probably the biggest sucker for all things personality-quiz. Really. I even read all the Chinese Year-of-the-Animal placemats at Chinese restaurants (but: never the zodiac, yo. Keeping it real and kosher up in here). The code “ENFP” stands for this category from the Myers-Briggs personality test. Now, Myers-Briggs is one of my favorite personality tests, probably because so often I read it and laugh and laugh because: helllllo, spot-on!! (There are internet quizzes for you, btw, if you want to take your own quiz. Then you can read the results and see (1) how we’re different and (2) if your description is accurate. Again, I love this game. It’s my stupid, mindless pleasure). And I read that and laughed, hooked, because: I’ve got a leetle shindig or two this weekend. And what is the most exciting thing about that? Well, there’s time to share what’s on our hearts, of course! Of course. That and the general party atmosphere. Why do most people to to parties?? For food? I’ll come back to these but, yeah, I forgot to eat lunch until 3:00 yesterday. Don’t worry, though, I had a big breakfast. (This is another reason I don’t live on my own. Would I eat? I’m not sure). AT THIS ONE I GASPED AND POINTED AT THE SCREEN AND KEPT POKING IT WITH MY FINGER. HOW DO YOU KNOW MY LIFE THIS WELL, INTERNET??? I turned the corner with the kind, quiet guy who volunteer with me. So, yeah, read more about ENFP’s if you want to understand a little better my particular brand of crazy. I even have an exercise for you. So: I have millions of ideas EVERY DAY. Every day of my life. The trick is: some are really good, and others are really awful. But, I honestly have no way of telling. It is impossible for me to tell. To remedy this, I’ve collected a close group of friends who are equal parts caring (since: artist-heart. Read: sensitive) and wise (mostly. I STILL FEEL LIKE LIFE-SIZE PUPPETS WAS A GOOD IDEA, KATHRYN), but direct when they need to be. Here’s your exercise. I’m going to give you two ideas that are maybe great, but probably not and you need to determine where they fall on the good-to-awful scale. Keep in mind…I do this to my friends EVERY DAY. When people ask, “How old are you?” I always feel awkward. Like, why are you asking me my age? So, yeah. I haven’t tried this. But! I hope someone does and tells me how it goes. OK, readers??? 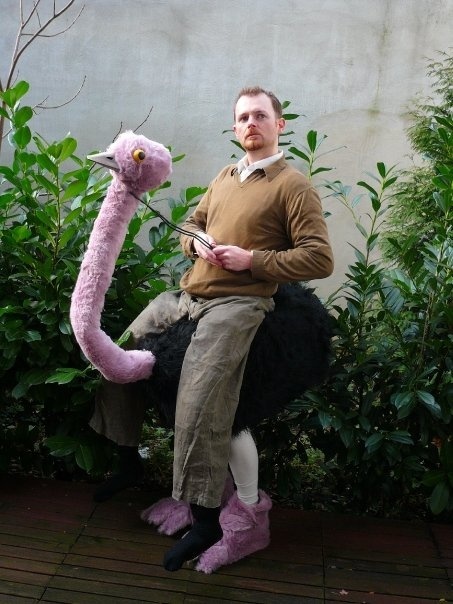 You know those costumes where it looks like someone is riding an ostrich? But really their legs are the ostrich legs? I’ve always thought it would be HIL.AR.IOUS to have a fundraiser where there’s a bet placed on an ostrich race but, really, the racers are just runners in ostrich-wearing costumes. And then the runners all race each other in the ostrich costumes. And everyone who attends, as a spectator, can dress up to the nines in giant hats and with canes and what not. It’ll be like the race scene from My Fair Lady or the Kentucky Derby, really. And it would be even better if the racers were kind of silly, too, and so they acted really serious…but sometimes, an “ostrich” could get obstinate or argumentative with the other ostriches. I’m just absolutely tickled by this idea. There you have it. I have no other things to say. But! I do have more ideas for more posts! 🙂 So, I’m just to leave you over here…high and dry. Toodle-oo!